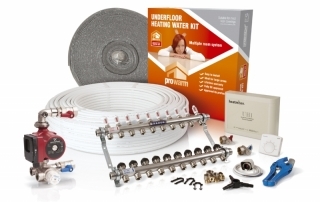 ProWarm™ Multi Room High Output Water Kits are the ideal choice for homeowners and tradesmen wishing to install a premium branded water underfloor heating kit. The single room water underfloor heating kit comes complete with 16mm barrier pipe for a higher output and are available in a various sizes to suit any size room. This product is ideal for combining one area of underfloor heating in a high heat loss area like a conservatory, with a standard radiator system. Please note: ProWarm™ Water Underfloor Heating kits feature a water temperature control. ProWarm™ only use high quality multi-layered barrier pipe. Its high specification means that it is also WRAS approved for drinking water installations. The aluminium layer acts as an oxygen barrier, preventing the oxygen diffusion through the polymer matrix, which stops corrosion of the metal components in the system.